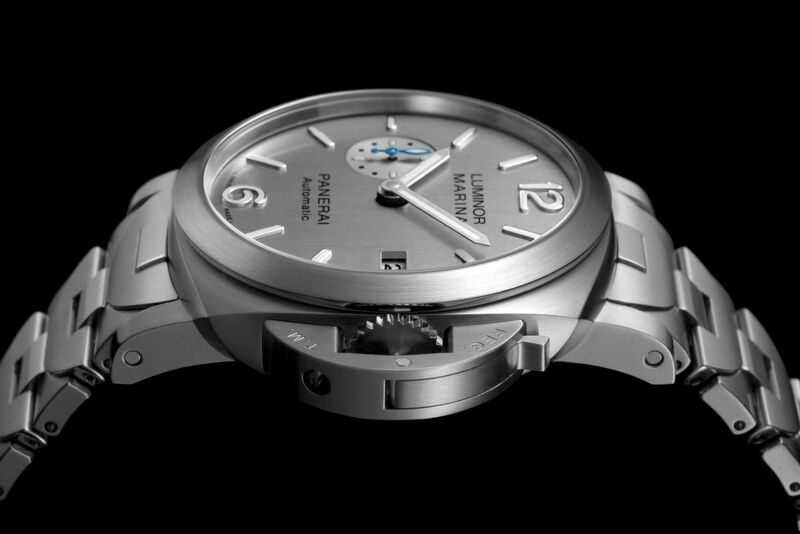 Panerai timepieces have traditionally echoed the brand’s naval heritage. Most modern day Panerai watches are remakes, in one way or another, of vintage timepieces originally produced for the commando frogmen of the second world war Italian navy. That meant black being the dominant dial colour. 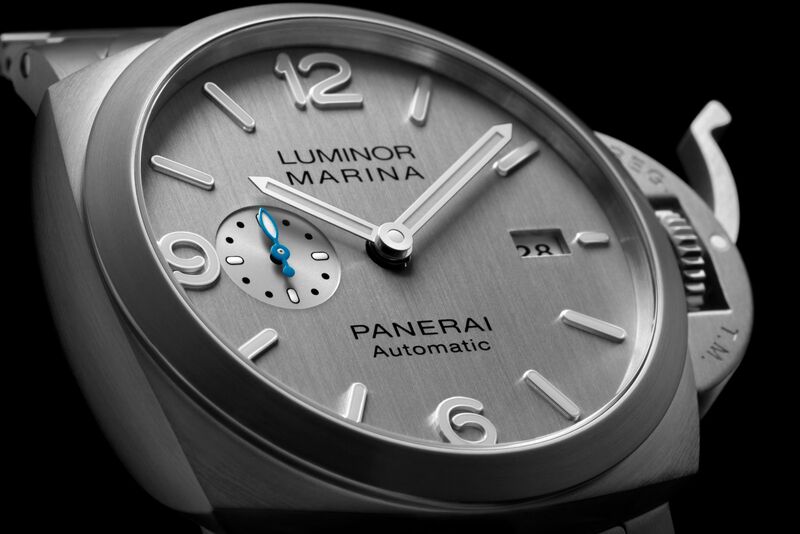 More recently, however, Panerai has evolved towards a more civilian-friendly look, which is exactly what the new Luminor Marina with a “silver-coloured dial” is all about. The new dial has a silvered finished with vertical brushing, and unusually for the brand, features applied hour markers. The applied hour markers are filled with white Super-Luminova, while the small seconds hand at nine is painted in pale blue, the only touch of colour on the dial. 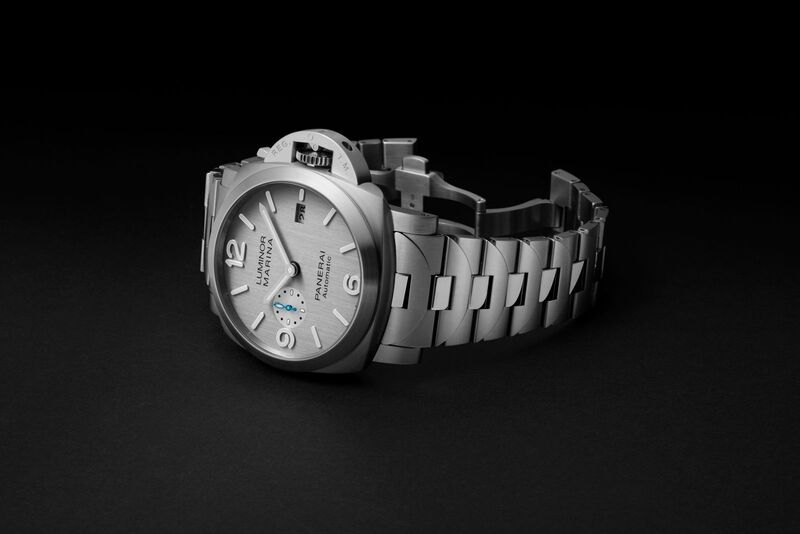 Available in both the Luminor Marina 42mm (PAM00977), as well as the larger 44mm model (PAM00978), the silver dial is a first for Panerai, and is also novel for being the first monochromatically silver watch. It’s a striking departure from the traditional, high-contrast Panerai dial that is designed for legibility underwater. 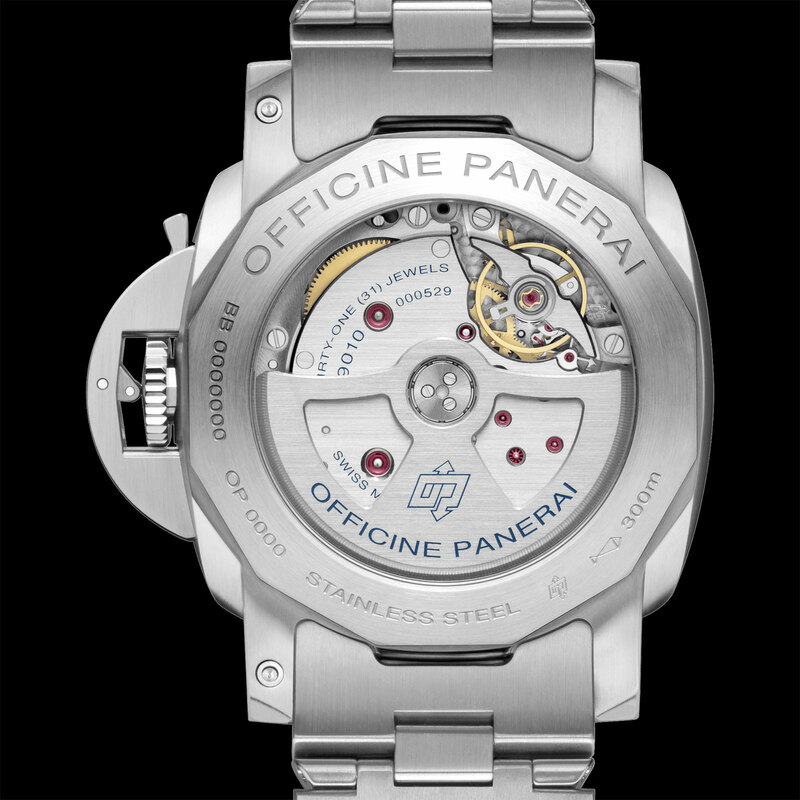 The PAM00977 and PAM00978 are both fitted with the new steel bracelet that made its debut in 2017, itself is an update of the bracelet Panerai launched in 1999. The bracelet links take a semi-circular shape that echoes the trademark bridge of Panerai’s patented crown locking lever. Though it retains the same basic design, the new bracelet is slimmer and designed for thinner timepieces. Each link is made up of three components, with alternating polished and brushed surfaces. 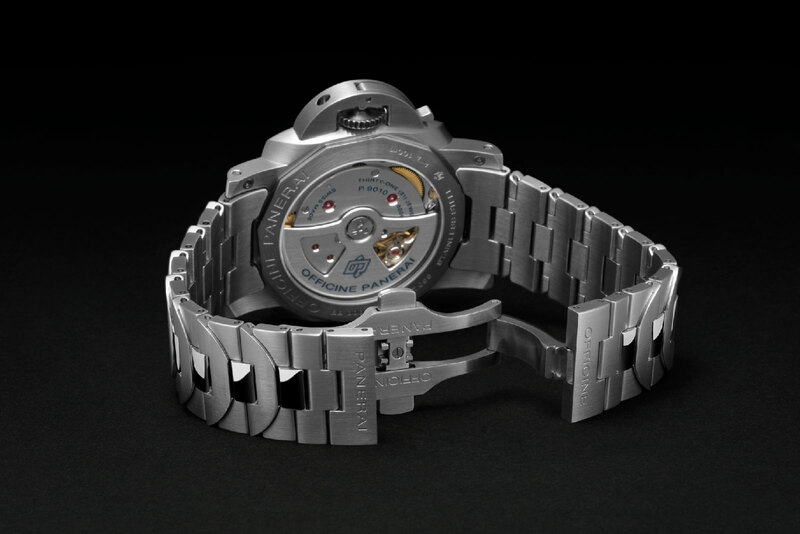 Both watches are powered by the self-winding P.9010, despite the different case size. That makes it easy to distinguish between the 42mm and 44mm models: with the seconds and date sitting closer to the centre of the dial, the larger version has an Arabic “9” as well as a longer baton marker at three o’clock. The in-house P.9010 has a power reserve of 72 hours, as well as an independently adjustable hour hand that makes changing time zones easy. While much about the two watches is identical, they diverge in one crucial aspect. The 42mm model is water-resistant to just 100m while its larger counterpart is rated to 300m. 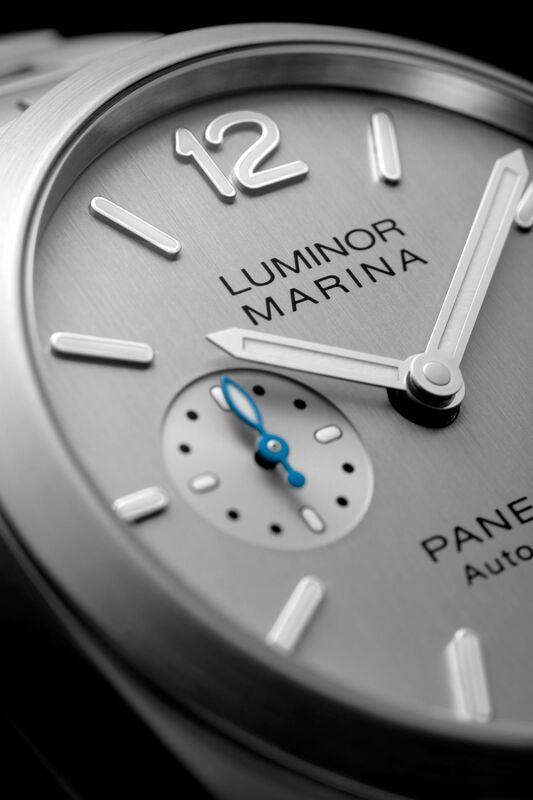 The Luminor Marina 42mm (PAM00977) is priced at US$8,400, or 12,100 Singapore dollars, while the Luminor Marina 44mm (PAM00978) is US$8,500, or 12,200 Singapore dollars. Both are already available at Panerai boutiques and retailers. 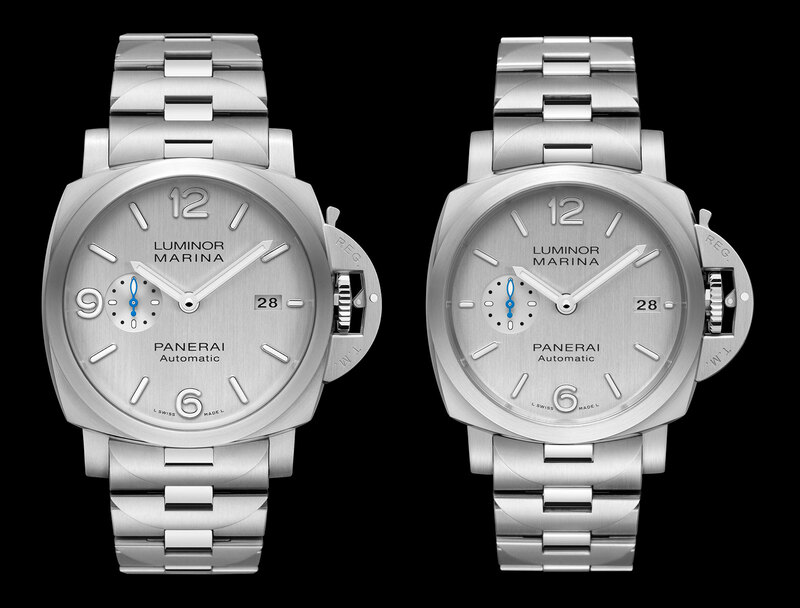 A trio with military green dials in each of Panerai's trademark case designs.